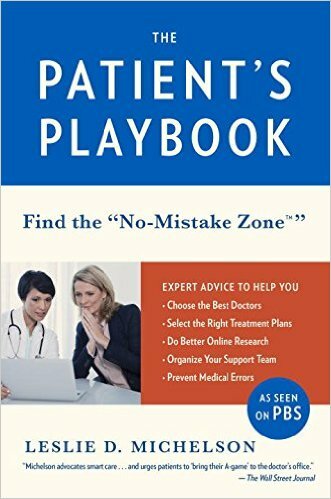 As a retired registered nurse, educator, and author of self-help books for my fellow pain warriors, I am thrilled to say that fellow author, Leslie D. Michelson, has done the patient community a great service by giving us “The Patient’s Playbook: How to Save Your Life and the Lives of Those You Love”. This book is aesthetically appealing, easy to use, and the author expresses relatable accounts of patient experiences. There are “what to do’s” for nearly all healthcare decisions. You will find tips for finding confidence and courage; asking questions; finding the right doctor; working through the logistics of access, insurance, and cost; exercising patient rights; developing a support team; carrying your entire health history with you; utilizing resources, and much more. Patient stories allow us to make objective assessments and catalog them in the file of “things to remember before, or when, it happens to me”, because in today’s fragmented and rushed healthcare environment bad things can happen. As the author suggests, hasty judgments, whether from the provider or the patient, increase the likelihood of mistakes, complications, unnecessary interventions, inappropriate referrals and other unwarranted occurrences. I recently experienced the fall out of hastened, fragmented care. My rheumatologist became my advocate and ordered the blood tests I felt my symptoms warranted, despite the new endocrinologist telling me my symptoms couldn’t be explained by my “numbers” and to discuss my symptoms with another doctor. When my results came in, my thyroid levels had swung from critical high to critical low in 7 weeks. Because of stories like mine, finding a doctor who is a skilled diagnostician who listens and cares about patients getting the care they need is imperative. Leslie Michelson has the information you need to make that happen. Every patient is vulnerable when illness strikes, despite the nature or urgency. As a nurse who cared for people in the emergency department, I know patients and family members are at their lowest point, they feel they have lost all control and their duress interferes with their ability to think logically. Often, the nurse or doctor must lead the patient or family member to give them the information they need. But, this doesn’t always happen. The Patient’s Playbook gives us what we need to be in command, whether it’s finding a new doctor or being hospitalized. It teaches us to be assertive, tolerant, proactive, and partners in our care. Lastly, a good self-help book gives the reader/learner the ability to interact with the material on a personal basis. The chapter summaries, “Quick Guides”, allow us to swiftly review areas of the book that provide information we need under certain circumstances. Even if you aren’t sick—right now—you can use the information found in The Patient’s Playbook to advocate for those you care about. You can also find him on Facebook at Leslie Michelson @PatientsPlaybook.